There isn’t a better way of choosing the right bread machine for you other than reading reviews and seeing the actual feedback from people who have actually used and tested the machines themselves. And I totally agree. You will find far more information in a post like this, rather than the product packaging or a too-pushy associate at a store. In addition to that, Amazon has an endless amount of choices. Far more than a Best Buy, Wal-Mart, or Target could ever possibly have. Therefore, it’s my pleasure to review and provide an honest insight into the products that you’re looking for. The Sunbeam Bread Machine is definitely one of the most popular bread machines, and it’s time for you to find out why. Sunbeam is one of the most popular brands of kitchen appliances and therefore, it makes some of the most popular bread machines. It’s needless to say that there are thousands of people around the world who have bought this specific bread machine and use it regularly. The Sunbeam bread machine is one of the rare products that provide even more value than the average user would expect, considering the price it sells for. So let’s have a look at some of the best features everyone’s been excited about so far. Needless to say, 600 watts of power is more than enough to mix and bake your favorite bread loaf without a single problem. While some people might say that that’s a lot of power for a simple bread machine. It isn’t. People don’t consider that such a simple machine isn’t so simple. It features a combination of many features that provide an unlimited number of options to users, ending up with a fully baked loaf in less than an hour. What I like is that even though the Sunbeam bread machine has 600 watts of power, it’s still very energy efficient. Thanks to the programmable settings of the Sunbeam bread machine, users are able to achieve and enjoy almost any bread type they can imagine. There are 12 different cooking functions to choose from. You can choose from many settings, and get your favorite bread in no time. Whether it’s cinnamon-raisin bread, gluten-free bread, whole-wheat bread, or any other – the Sunbeam bread machine will produce it. The Sunbeam bread machine is suitable for anyone from singles, couples, to larger families. You can choose between three different loaf sizes to suit your needs. There is a setting that allows you to choose from 1 lb, 1 and a half lb and 2 lb loaf size. You will never be too short or left hanging with extra bread. Cooking options and programmable settings aren’t the only things you get to choose. There is a crust control setting that lets you get the right bread color, and achieve the right crispiness of your bread, just the way you love it. But don’t worry, it’s fairly simple to use settings and there’s nothing that will overwhelm you. There are only 3 crust shades you can select. Use it in combination with other programmable settings, and you will have a wide variety of bread options. If there was no such option, people wouldn’t be able to wake up to a freshly baked bread right in their kitchen. .
And that’s why I’d recommend this feature to anyone who’s looking to purchase a bread machine. The Sunbeam bread machine has a delay timer which can delay the baking process up to 13 hours. Simply put all the ingredients following the right order, and set the timer. I love to use delay timer to set the baking process early in the morning, so when I wake up – freshly baked bread is waiting for me. At the front of the Sunbeam bread machine, the first thing you will notice is an LCD display. Around it, there are buttons that will help you guide through the controls. Everything is clearly stated for easy operating. Even someone without any experience in bread making will find his or her way easily. There is also a manual with instructions and recipes that definitely help you get started with the machine. The baking pans of the Sunbeam bread machine are coated with a non-stick coating that makes sure ingredients and bread don’t stick during the mixing or baking process. Therefore, the same cleaning process is way easier thanks to the specific coating. Also, pans are removable which makes it very simple to clean and maintain. The Sunbeam bread machine comes with a 1-year warranty that will have you covered in case of any problems during the first year since purchase date. Sunbeam has wonderful support. They’re available through both a telephone call and e-mail. They might even have an online chat on their official website, but I’m not quite sure about that. The Sunbeam Programmable Breadmaker boasts an impressive 4.3/5 stars on over 1,900 customer reviews! Considering the price of the Sunbeam bread machine, it’s needless to say that there isn’t a better bread machine on the market for the price. 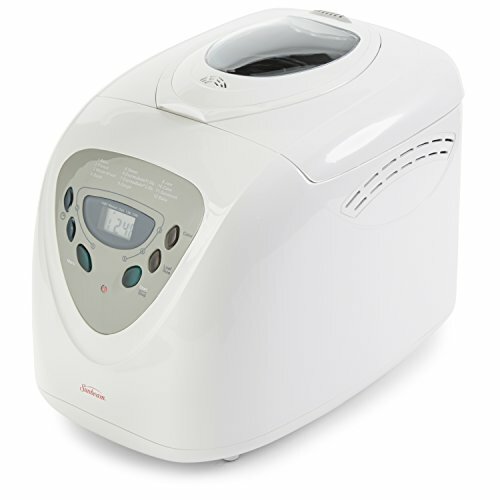 It comes with many features, even some features that can be seen in more expensive bread machine models like the Zojirushi Virtuoso Breadmaker. It’s going to work very well for people who have never baked their own bread, as well as for people who are experienced with bread machines. Other than everything necessary to break your first bread, Sunbeam has even included their own recipe book that will get you going. I’d definitely recommend it, as many other people would – I’m sure. You won’t be disappointed!